Technical Rescue Air Cart (A2171) :: Fenton Fire Equipment Inc.
Air Systems MP-TR1 21.0" Width, 15.5" Depth, 4500psi Technical Rescue Air Cart used. My father passed away and this was among many of the tools he had. Had it tested and it works perfect. Asking $2200 obo and here are the specs. 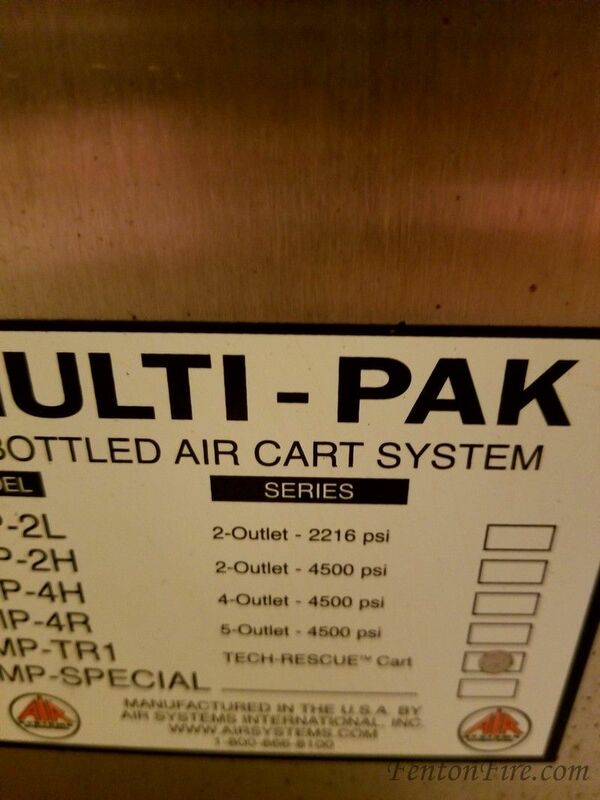 The patented tech-rescue cart has been designed to provide air for all of the various respirators and unique rescue tools that are used by Technical Rescue teams. 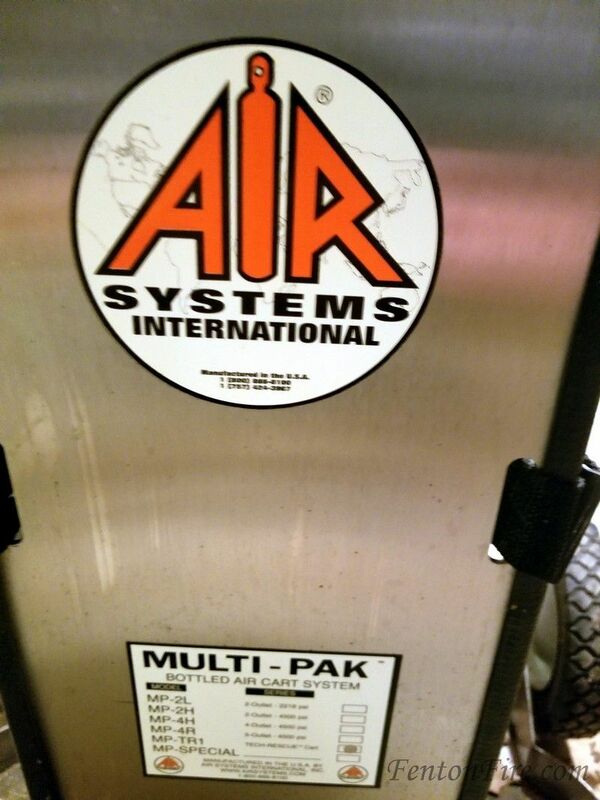 Air systems has designed a unique stainless steel cart with a color-designated control panel to allow one side of the panel to be used for primary respirator breathing air and one side for tool/secondary air requirements. A low pressure whistle alarm is used on the yellow side of the panel and a low pressure bell is used on the blue side of the panel, both alarms activate if the auxiliary inlet is used as the primary air supply. The standard features of the TECH-RESCUE Cart make it the most versatile and unique air cart in the fire service industry. Now available with an optional 5 feet quick-fill hose assembly to meet NFPA (national fire protection association) requirements. 4 adjustable nylon with velco cylinder straps. Bleeder valves allows depressurization of hand tight nuts. Check valves allows independent cylinder operation. Respirator pressure Regulator: 0-5500psi inlet; 0-125psi outlet. 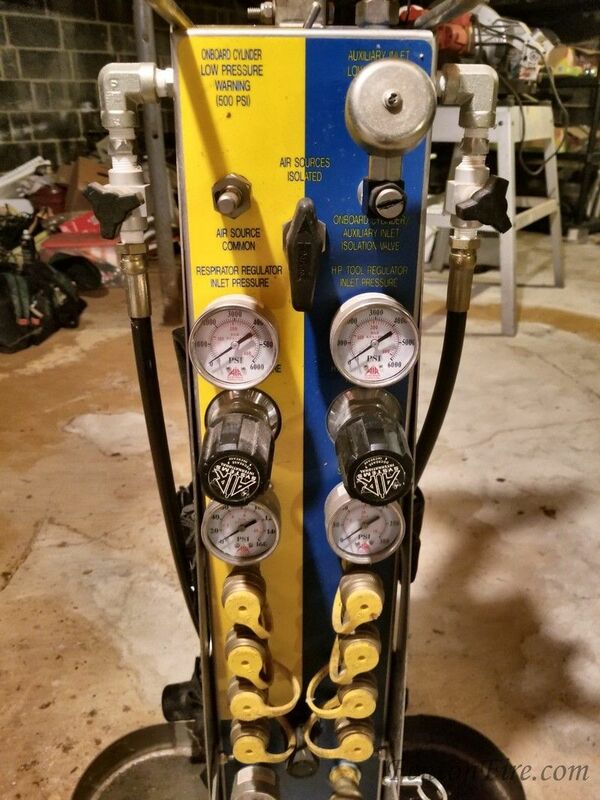 High pressure tool regulator: 0-6000psi inlet; 0-275psi outlet. Low pressure tool regulator: 0-300psi inlet (inlet pressure set by high pressure tool regulator's outlet pressure); 0-125psi outlet. Relief valve (yellow) setting side: 125psi ASME preset; 116cfm flow rate. Relief valve (blue) setting side: 275psi or 125psi ASME preset relief valves manually selected by pneumatic toggle, 241/140 cfm flow rate respectively. Air Distribution: 4 respirator quick connect sockets, 4 high pressure tool quick connect sockets, 1 low pressure tool quick connect socket. Intrinsically Safe: no electronic devices. 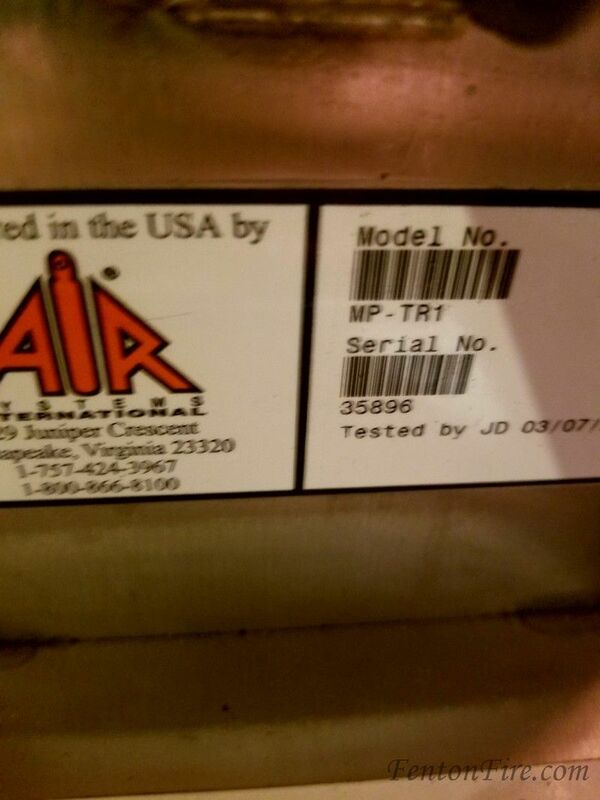 Air supply low pressure warning: Onboard cylinders, pneumatic whistle set at approximately 500psi. auxiliary inlet, pneumatic bell set at 500psi.